Our misson is to maintain a free neutral communications platform under the Communications Act (47 U.S.C & 230) whereby vacation rental managers and homeowners can communicate directly with travelers from around the world in private and book room rental accommodations without paying any booking commissions to any third-party online travel agencies (OTAs). We don't engage in any property management activity. We never engage in the unethical behavior of marketing your competition's room specials to your customers. We don't block or interfere with any communications between you and any of your potential guests. We do not collect any personal or private data from anyone. 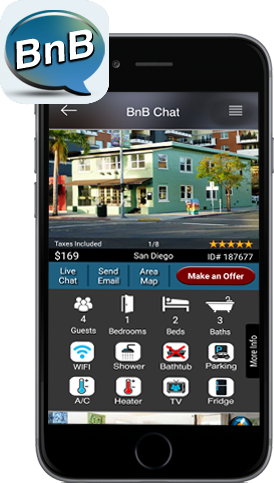 Now's the perfect time to add BnB Chat to your marketing channel and start saving yourself and the customers whom you've serviced for years 10% to 30% in commissions and fees. Note:Please visit the IRC 280(A) and the Publication 527 links below regarding the ("de minimis rental rule") whereby every American has the right to rent their dwelling 14 days per year tax-free.